Product information "Nexys Video Artix-7 FPGA: Trainer Board for Multimedia Applications"
The Nexys Video, powered by Xilinx Artix-7, was nominated as top innovative product 2016 in Embedded Computing Design. The Nexys Video features several components that make it ideal for developing audio/video applications. The Artix-7 XC7A200T FPGA is the most powerful chip from Xilinx's Artix-7 family. A Mini DisplayPort source provides the board with a uni-directional, high-bandwidth, low-latency audio/video channel. Designed with high bandwidth external memories, three high-speed digital video ports, and a 24-bit audio codec, the Nexys Video is a potent platform for A/V development. As a member of the Nexys family, the Nexys Video has been designed with a high degree of communication, user and expansion peripherals commonly found in industry. Communication peripherals such as on-board Ethernet, USB-UART and high-speed USB allow the Nexys Video to be interfaced into larger systems. Onboard user peripherals such as switches, buttons, LEDs and an OLED display allow users to interface directly with their designs instead of needing to wire up additional I/O. An FMC connector and four Pmod connectors allow the addition of peripherals to further expand the functionality of the Nexys Video. The Nexys Video is compatible with both ISE and Vivado toolchains. It is supported in the free WebPACK versions of these two tools so designs can be implemented at no additional cost. The free version of Vivado even includes the ability to create MicroBlaze soft processor designs. 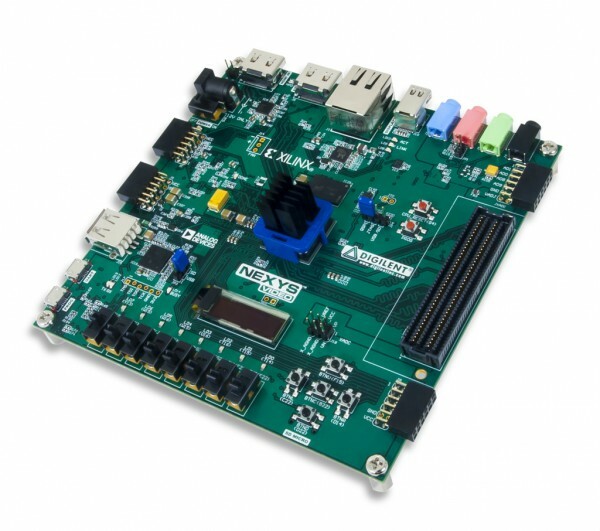 Related links to "Nexys Video Artix-7 FPGA: Trainer Board for Multimedia Applications"